Customer first marketing is the holy grail of advertising, but we tend to only talk about marketing on a one-to-one basis. This is where the idea that marketing is creepy comes from: what we’re calling customer first is still just driving our sales. We should be putting our customers, rather than our marketing goals, first if we want to truly lay a claim to the “customer-first” mantra. 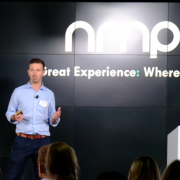 James Sleaford, Managing Director of DQ&A, uses many of his own experiences to demonstrate the problems with the current model of “customer-first”. Up until February 2018, he was still receiving emails from Booking.com with recommended destinations in Bali – a place he visited back in October 2014. Science and data are clearly telling them that this works, but for some this has an opposite effect. A customer would likely have a better experience if they were given similar locations, but not the same. This is hardly the only example of this. Consider an ad for a German classical music streaming app, served to an English tourist only after they returned home. A free drink offer sounds like a good idea, but if it’s not on anything your consumer ever buys then what’s the point? What about a dress that you might view once, but ends up following you around the internet for months after? The data and science might suggest that it works, but by only using science you’re never going to give a consumer a great experience. 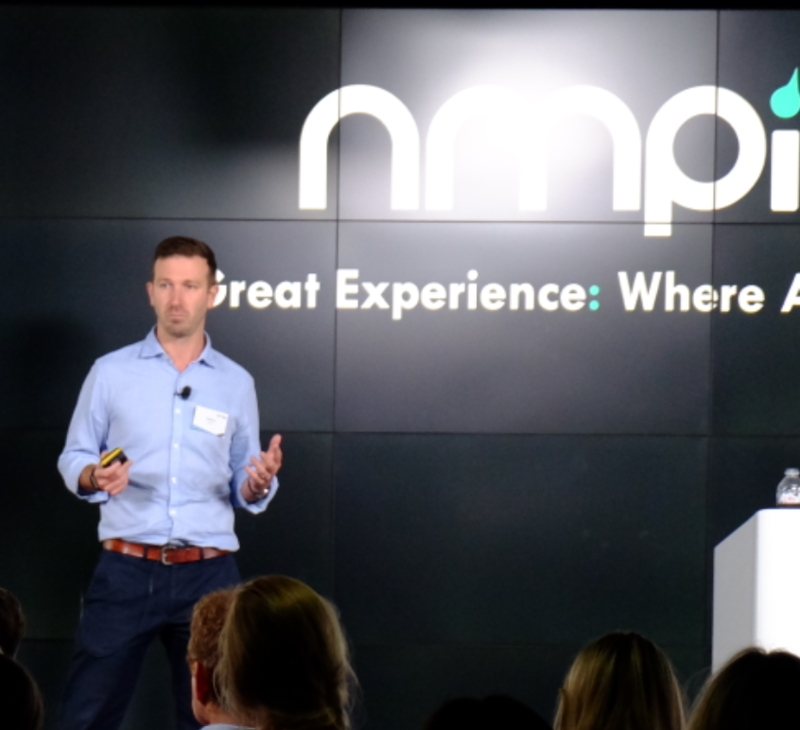 If we as advertisers want to communicate with customers who want to engage – which leads to higher lifetime values, and develops a mutually beneficial relationship – then we need a full digital transformation. 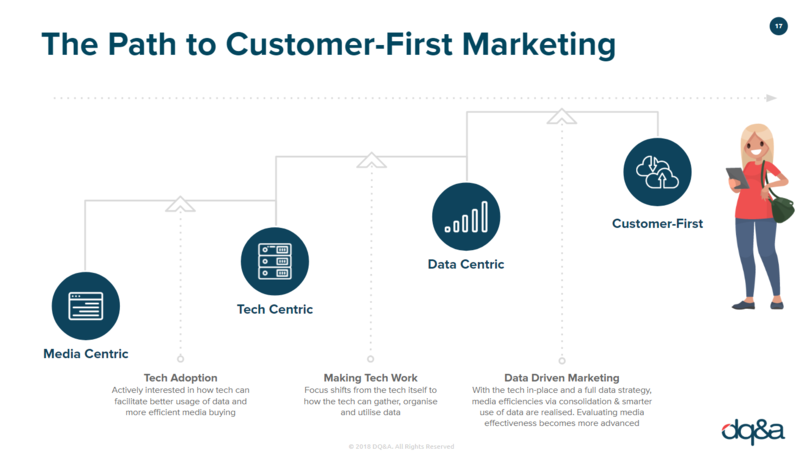 The path to customer-first marketing will take us from a media-centric approach to a tech-centric approach, up to a data-centric approach until our approach places the customer firmly at the centre. Now, there are “6 Ps” of digital transformation: Plan, People, Partners, Platforms, Process and Personalisation. Of these, James focuses on Platforms, and in particular the Google Marketing Platform. 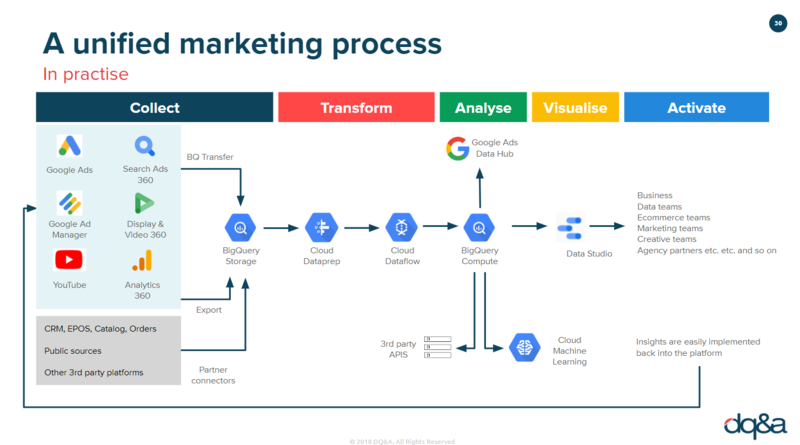 A unified tech stack such as Google Marketing Platform allows you to move data from one place to another – something that wasn’t possible before. It also improves efficiency and performance straight away, gives you better data integrity, and helps you to break down human silos. There are some things that marketers can’t get hold of through Google Marketing Platform, such as logistics, business reporting and CRM data. These business insights can all be stored in the Google Cloud. With all of these insights in one central place, you can increase collaboration across your media and creative agencies, your ecommerce team, your data & business analytics team and your tech team to once again break down silos and improve efficiency and performance. To move towards true customer-first marketing without appearing creepy, we should be taking on even more signals from our customers to find out how to create an experience that delights. Check out DQ&A’s case study on Transavia to see how this can be done in practice.